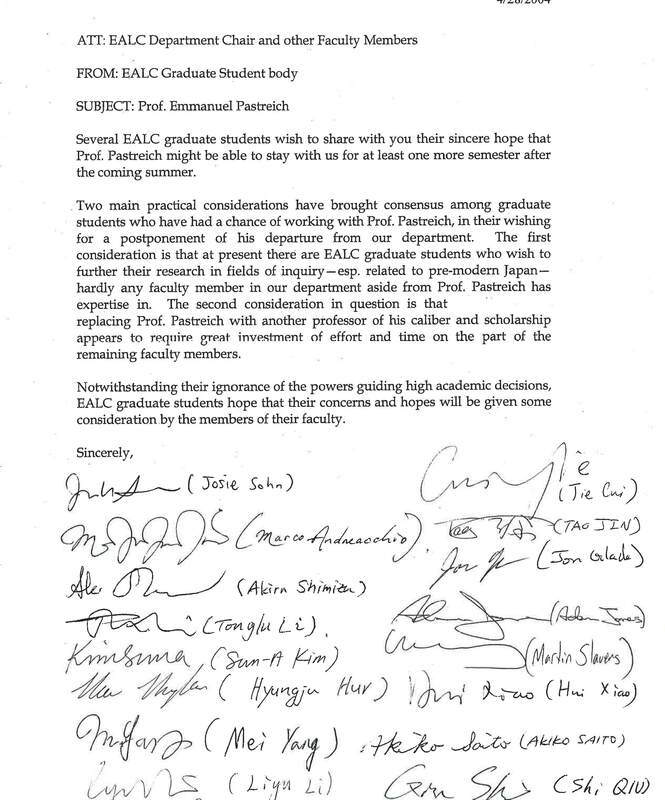 Although none of his fellow faculty members spoke to him about this decision, or expressed any opinion at all, the graduate students of the department drafted and signed a letter that appealed this process and presented the letter to the department head, Professor Jerry Packard. The tenure review committee had never met with Emanuel, or done anything but request documents via email during the review. At the time, Emanuel had three articles in major journals and had written three chapters for the Columbia History of Chinese Literature. None of that work was considered relevant. Following that dismissal, Emanuel was unemployed for almost three months. Only at the end of February, 2005, was the Embassy of the Republic of Korea so kind as to offer him a job working at its culture center in Washington D.C.
Emanuel was deeply touched that the students made such an effort on his behalf. He realized that only young people are seriously interested in confronting the institutional corruption that is destroying our society. He believes that young people are our only hope.